Information: This black and white, 128 page art insruction book was released by Graphic-Sha in Japan on October 25, 2003. It featured tons of classic model sheet drawings, along with new pieces of art from Tatsunoko animator Chuichi Iguchi. The goal was to show different styles of basic figure illustration using Tatsunoko's designs and characters as reference. Iguchi provided new examples of how to draw bodies, heads, hands and more, and model sheet illustrations were used to show how to draw variations on the basic ideas. 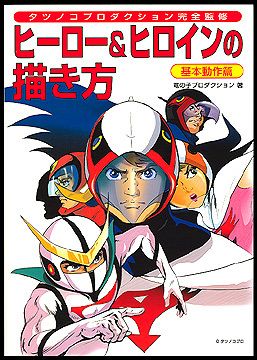 As an art instruction book, it leeft a lot of ground uncovered, but any book with previously unseen Tatsunoko artwork was a welcome addition. After the instructional chapters, a brief gallery of new illustrations by Iguchi was included.